Ouch. Take comfort in knowing that you are not alone. Millions of other parents are experiencing the same pain in their chest at the thought of financing a college education for their sons and daughters. Quicken can’t perform any miracles to turn the tide of rising college costs, but it might help you formulate a plan for how to stay afloat. Suppose that you have a child who may attend college in 16 years. And you haven’t started to save yet. If the local university costs $10,000 a year and you can earn 9 percent annually, how much should you save? 1. Choose Planning –> Financial Calculators –> College Calculator. Quicken displays the College Calculator dialog box, as shown in Figure 1. 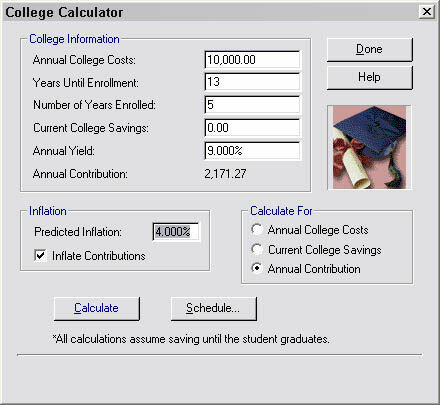 Figure 1: Use the College Calculator dialog box to determine whether you will have to take out a second mortgage to pay for Junior’s college education. 2. Enter the annual college costs. Move the cursor to the Annual College Costs text box. Then type the current annual costs at a school Junior may attend. Figure 1 shows this amount as $10,000. 3. Enter the number of years until enrollment. Move the cursor to the Years Until Enrollment text box and type a number. For example, if Junior will start college in 13 years, type 13. 4. Enter the number of years enrolled. Move the cursor to the Number of Years Enrolled text box and type a number. Assuming that Junior doesn’t fool around, type 4 or 5. 5. Enter the amount of the current college savings. Move the cursor to the Current College Savings field and type an amount. Figure 1 shows this amount as $0.00. 6. Enter the annual yield that you expect the college savings to earn. Move the cursor to the Annual Yield text box and type the percent. Figure 1 shows the yield as 9 percent. 7. Enter the inflation rate anticipated in college tuition. Move the cursor to the Predicted Inflation text box and type the inflation rate percent. Figure 1 shows this rate as 4 percent. 8. Indicate whether you plan to increase your annual contribution as a result of inflation. Select the Inflate Contributions check box if you plan to annually increase — by the annual inflation rate — the amount you save. Figure 1 shows this check box selected. After you enter all the information, click Calculate or move the selection cursor. The Annual Contribution field shows how much you need to save each year until the child graduates from college. Just to beat this thing to death, Figure 1 shows that the lucky student will attend five years at a college that currently costs $10,000 a year and that you expect to earn 9 percent annually and anticipate 4 percent annual inflation. Given these cold hard facts, you need to start saving $2,171.27 every year. To get more information on the annual deposits, tuition, and balance, click the Schedule button, which appears on the face of the College Calculator dialog box. Quicken whips up a quick little report showing the annual deposits, tuition, and ending college savings account balances for each year you add to, and Junior withdraws from, the college savings money. Look at the positive side: You now understand the size of the problem and the solution. Use the Calculate For option buttons to compute a specific financial variable. Select the variable you want to calculate and then input the other values. The College Calculator computes the flagged variable. Finding a less-expensive school isn’t necessarily the same thing as looking for the cheapest tuition fees. Another huge factor these days is whether a program takes four years or five years to complete. A cheap-tuition school that requires five years may be more expensive than, say, a good private school that gets a student out — and working — in four years.